12.5" RCOS @ ~f/9 (2880 mm fl) 0.64 arcsec / pixel. The Zoomify image scale is 0.64 to 3.40 arcsec / pixel. CCDSoft, CCDStack, Photoshop CS3 w/ the Fits Liberator plugin. 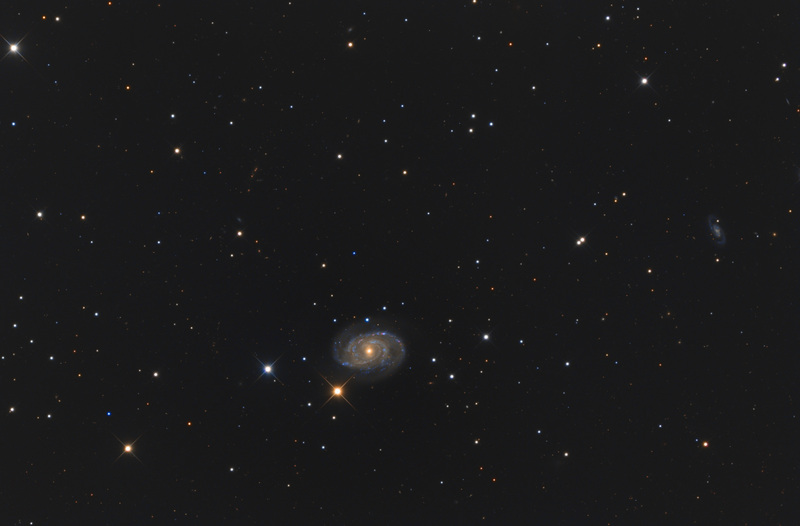 eXcalibrator v3.1 (g-r) color balancing, using 37 stars from the SDSS-DR8 database. CCDBand-Aid (pre-beta) to repair the STL-11000M vertical bars. CCDStack to calibrate, register, normalize, data reject, combine the sub exposures, and the RGB color image. PhotoShop none-linear stretching and the LRGB combine. North is to the left. At a distance of 122 million light-years, NGC 5371 is a face-on Sbc barred spiral galaxy in the constellation Canes Venatici. As an SBc galaxy, NGC 5371 looks similar to our galaxy, The Milky Way. NGC 5371 is also cataloged as NGC 5390. Just outside NGC 5371, at about 4 o'clock, is a bright blue quasar at magnitude 18.3. With a redshift of z = 1.595, its light travel-time is about 9.3 billion years. To the far right-center is the galaxy UGC 8841, at a distance of 116 million light-years.